(VEN) - Ninh Binh Province has become a key tourism destination in the north, providing a successful model for other provinces and cities throughout the country. In particular, it has had great success in the promotion of public private partnerships (PPP) in tourism development and heritage conservation. Over the past six years, Ninh Binh has strived to enhance cooperation with travel companies in order to boost local tourism. While the province recorded nearly one million tourists in 2007, this figure rose to 4.39 million tourists in 2013, a 99 percent increase over 2009. Last year, it recorded about VND942 billion in tourism revenue, and a 21.5 percent increase in the number of tourists over the previous year. 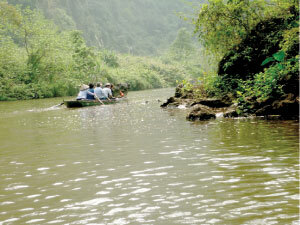 Ninh Binh has also focused investment on its tourism infrastructure. Passenger boat services from the Trang An Ecotourism Complex has been well managed and maintained, despite huge numbers of tourists visiting the complex during early spring. According to Director of the Ninh Binh Department of Culture, Sports and Tourism Lam Quang Nghia, the province will strive to implement the Heritage Law, and will call for investment in conservation and promotion at local heritage sites. It expects to welcome about 4.5 million tourists and to record VND1.2 trillion in tourism revenue this year. In addition to Ninh Binh, Quang Binh Province has also applied PPP models in tourism development and heritage conservation since March 2010 at the Thien Duong Grotto, an integral part of the Phong Nha-Ke Bang National Park, which has been managed and exploited by the Truong Thinh Group JSC. To date, Sun Spa Resort-Duong Grotto-Tam Co Cave tours have attracted lots of tourists, contributing significantly to the local heritage-based tourism development over the past few years. Quang Ninh Province has also proven to be a model to follow through the persification of improved tourism products and services through PPP models in tourism development and heritage conservation. Such measures have helped Ha Long become more beautiful in the eyes of tourists, and the city has also improved a lot in terms of its transport infrastructure to better satisfy tourists’ travel needs. According to statistics, about 65 heritage-related projects totaling VND500 billion have been deployed at Ha Long Bay, which have helped improve the site overall, benefiting both local and international tourists. “We will continue to conserve and promote Ha Long Bay in a sustainable way and will call for domestic and international investors and organizations, in addition to support from relevant ministries and agencies in order to make it a world natural heritage site forever,” said Director of the Ha Long Bay Management Board Pham Thuy Duong. Natural heritage sites are an important contributing source for the country’s socioeconomic development. As such, better conservation and management of these sites through PPP models will help these localities boost their economies over the long term.